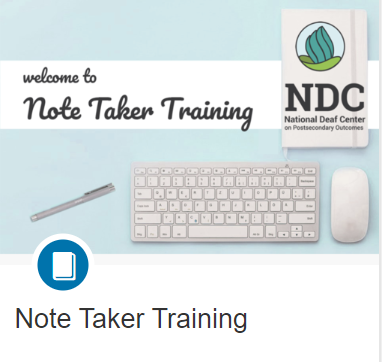 Note Taking: An Introduction (PDF, 2 pages, 2018) provides information on why note taking is an important accommodation for deaf individuals as well as what characteristics to look for in a qualified note taker. Note Taker Training is a free training module intended for student note takers at the high school or postsecondary level. The training defines the role of a note taker and provides useful strategies to provide accurate, comprehensive classroom notes for other students. This course is FREE and individuals receive a printable certificate upon completion of the training. The description says the course began September 5, but actually the course is sefl-paced and can be taken any time. It’s designed to be completed over a week’s time. The National Deaf Center on Postsecondary Outcomes website offers other resources and trainings – check it out! Thanks to the National Deaf Center on Postsecondary Outcomes website for the information in this post.